This is a favorite Halloween movie for most of us, and it was for my 3 year old. She is obsessed with the color green, and so, was obsessed with Oogie Boogie, the villain from the Nightmare Before Christmas who is a gambling burlap sac of maggots. 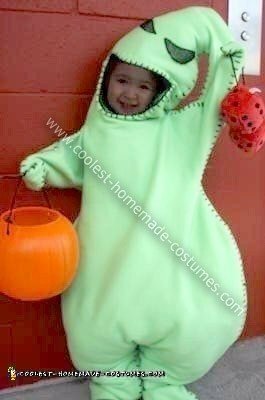 Of course, to make this Homemade Toddler Oogie Boogie Halloween Costume more comfortable, I used fleece to outline my daughter’s body. I free hand cut and sewed the suit with my sewing machine and the outside seam was hand stitched with yarn. The entire costume was lined with another layer of fleece so that she could be stuffed with polyester filling to simulate being stuffed with bugs. Her headpiece and suit were made together, and there was only one slit in the back that she used to get in and out. Most of the head was filled with stuffing but I left some of the end of the head unstuffed so that it wouldn’t be too heavy. Her mouth is what she saw through and it was covered with mesh and molded with wire. I got the fuzzy dice from a local Gothic store and that completed the look! This Homemade Toddler Oogie Boogie Halloween Costume was a great hit at the local trick or treat neighborhoods and she is already planning next years costume! Great costume!! Really good Job, looks just like Oogie Boogie! This is truly amazing. I was wondering if i could buy one off you for my dad? If i email you the sizes you need could you make one and i buy it? I beg my dad every year to go as oggie boggie. Let me know. Would you consider making one to sell? What would be the price range? I am very interested in purchasing one. Any kind of reply would be greatly appreciated. I am extremely in love with this costume you did such an amazing job making it! My toddler who will be 2 in October has a nightmare before Christmas themed bedroom we are huge fans! Do u make costumes to sell and if so can I please arrange to order. Jeffjondall@yahoo.com its my husbands email please let us know! How did you keep the head from falling down? I’m going to make this for my one year old and have zero sewing experience.